I think that sometimes we lose site of this holiday. It is easy to think we’ve got to spend mega money to celebrate Mother’s Day. Don’t get me wrong, it is a wonderful day to pamper your mom and just show her that you appreciate her and all she did for you. However, celebrating Mother’s Day is more than about the money you spent. It is about being with your mom and taking time out to acknowledge her. It is about doing something special with her if you’re blessed to live close enough to her. Mother’s Day is about spending time or making that phone call she says she never gets. She wants to be with her children and have her children near her. Once a mom gives birth, that son or daughter is very special to her. Yes, I know not everyone has that connection, but for many, it does exist. Going out to eat or buying her flowers can be awesome things to do if you have the mans to do it. Downloading some relaxing spa music like I have on here can be a gift she gets to use for days after the time we celebrate Mother’s Day. Even a nice spa day can be so welcomed by a mom. Don’t think you have to spend a lot of money though because there are so many things you can do that she’ll enjoy just as much. 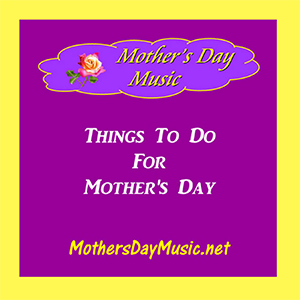 If you look at the ideas that I’ve listed on this MothersDayMusic.net website, you’ll see some of them don’t cost a cent. Whatever you do, put some thought into it. Make it special for your mom and most of all, don’t forget it! Don’t put it off until the last minute and then scramble to figure out what you are doing. It does show. Really, put some time into making it a special day for your mom. She’ll truly love you for it. After all, your mom not only carried you for 9 months, she has had to probably go through a lot of stressful times with you while you were growing up. Sure, a mom loves her child, but anything you can do to say, “thank you mom, I appreciate and love you” is more than welcomed by most. Feel free to share your ideas on ways you can make Mother’s Day special by commenting on this post. I’m sure others will be happy you did!